There is nothing scarier than having a trailer whipping back and forth behind you. I speak from experience, as it happened to me several years ago. I was towing a trailer with 2 motorcycles on it when it got out of control. That utility trailer forced me back and forth across 4 lanes of freeway before I was able to slow down and regain control! Many states require trailer brakes on any trailer over 1,500 lbs. This trailer was not required to have brakes, but it was still enough weight to overpower the mid-sized car that I was driving. 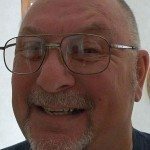 I learned that day that how you load a trailer is critical when it comes to safety, handling, and the ability to comfortably travel without worry. That, and the importance of an Equalizer Hitch. Loading your RV trailer properly will prevent a situation where the tail is wagging the dog. That is something that can ruin your vacation permanently! Proper loading of a trailer will have about 10% of the total weight of the trailer as tongue weight. That means that if your trailer’s total loaded weight is 5,000 lbs, the weight at the hitch will be at least 500 lbs. How you stow your gear can greatly affect the tongue weight of your RV trailer. As an example, if you fill the under-the-bed storage space in your rear bedroom trailer with books, tools, or even canned goods, what you are really doing is counter-balancing the manufacturer’s designed tongue weight, creating a tail-heavy situation. This is what happened to me with the utility trailer. It’s the most dangerous condition you can possibly have and will scare the heck out of you! To correct this situation, an Equalizer Hitch is used to redistribute the weight of the trailer over the entire tow vehicle. When you set the chains on the bars of your Equalizer Hitch, you are transferring some of the tongue weight to the front axle of your tow vehicle. Finding the “sweet spot” or exact correct link point may take a couple of tries. If you don’t apply enough tension on the bars, you’ll find yourself “see-sawing” on poor highways. Setting the chains one link tighter will probably transfer enough weight that the whole unit will even out and ride up and down together. If you go to the other extreme and set your chains with too much tension, you’re taking weight off the rear wheels of your tow vehicle. A dangerous situation as you will lack traction on rain slick roadways and you may find yourself spinning your wheels when maneuvering on gravel or grass. Sway controls are sold to help prevent travel trailers from swaying back and forth. My personal opinion is they are of minimal effectiveness. What they do is apply friction to reduce the sideways motion when a trailer starts to sway. They attach to the side of the trailer’s tongue and to the side of the hitch on the tow vehicle. You adjust the amount of friction it applies to increase the amount of restriction. 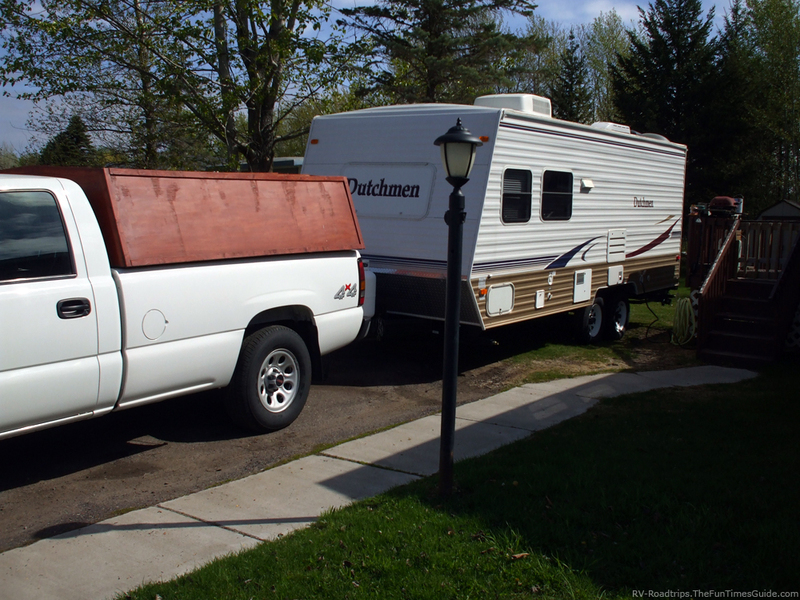 If your RV trailer is properly loaded, and you have the bar tension correct on the Equalizer Hitch, towing characteristics should be sufficient. 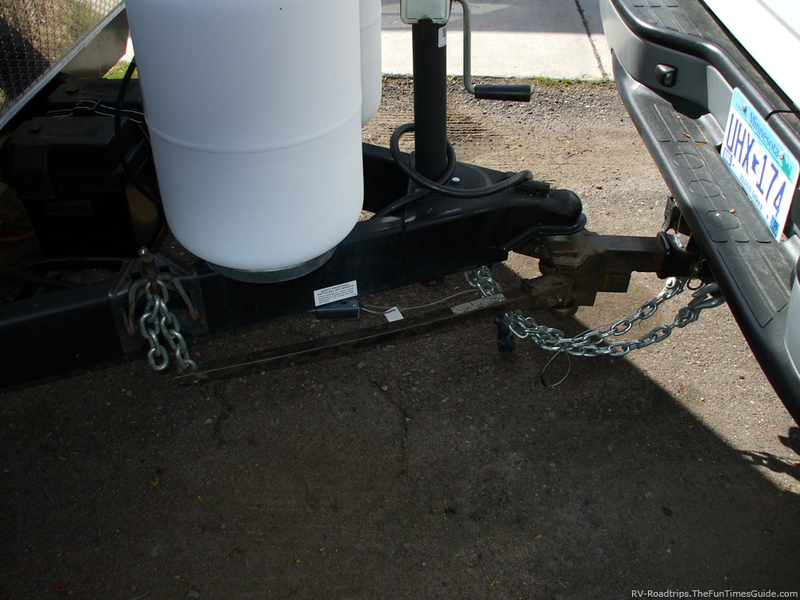 One thing to remember… very long travel trailers just don’t tow all that well. It’s the nature of the beast. With their axles located approximately in the center of the rig, long trailers have a natural tendency to sway. If the wheels were located at the rear of the trailer (such as how semi trailers are designed), there would be no swaying to deal with. Of course, your pickup couldn’t carry that much tongue weight. In the event that you find yourself with your trailer unexpectedly swaying, just press the lever on your electric brake controller to apply only the trailer brakes. By using the trailer brakes to slow you down, the swaying will safely subside and you can regain control. I didn’t have trailer brakes when I had my out-of-control situation. I just had to hang on and hope for the best. It will take only one experience like that to convince you of the importance of an Equalizer Hitch and proper loading of your trailer. What it all comes down to is this: by not being the fastest vehicle on the freeway, you can still be comfortable towing a good-sized travel trailer all day. Besides, by taking the secondary highways at 55 mph you will save some gas and you’ll have a chance to enjoy the scenery.